Since 1950, Associated Grocers has shaped the modern business practices of independent grocers across the South, and currently serves over 200 retailers in Louisiana, Mississippi, and Texas. As a retail operations support and solution center, Associated Grocers is always searching for innovative approaches for procuring, processing, and selling food products. They reached out to Envoc’s mobile app development team to streamline the collection of product data during meat grinding processes, and automate the creation of Grind Log and Recall Reports for audit and internal purposes. Envoc was more than prepared to deliver exactly what they needed. Since Associated Grocers services a large region, hundreds of stores, and dozens of meat products, they wanted to replace their current workflow with a process that would make logging and reporting more efficient while decreasing the possibility for error. Inspections are still processed manually; notes are scribbled by hand, and important information can be misread or overlooked completely. Contamination can occur at any point, and analog reports can’t provide on-the-spot, complete information to be sure that every contaminated grinder has been serviced. However, Associated Grocers was mindful of their longtime and less tech-savvy employees’ aversion to change. Simplicity was a top priority, second only to quality assurance and consumer safety. 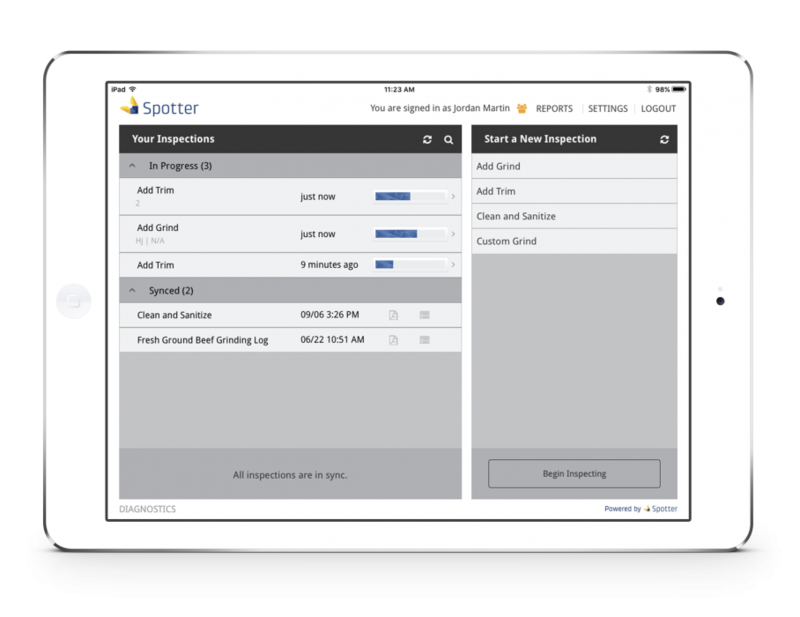 We already have a powerful and customizable inspection app we built named Spotter. 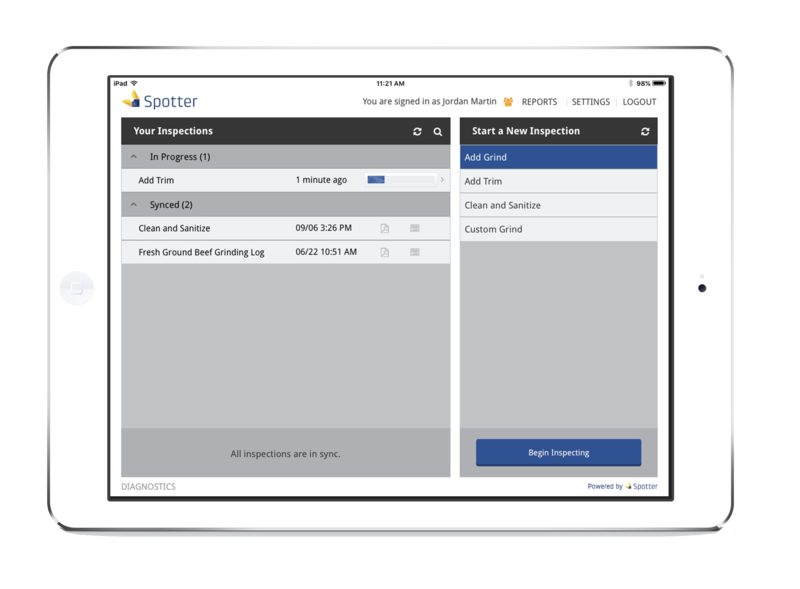 Instead of building a costly standalone mobile app from the bottom up, we knew we could utilize Spotter’s existing infrastructure to reduce cost and time to complete the project. However, Associated Grocers needed very specific reports, so we created a custom web portal from which filtered data could be exported in the necessary reporting formats. The numerous fields of data multiplied by the scope of the Associated Grocers operation required precise and easily identifiable information. 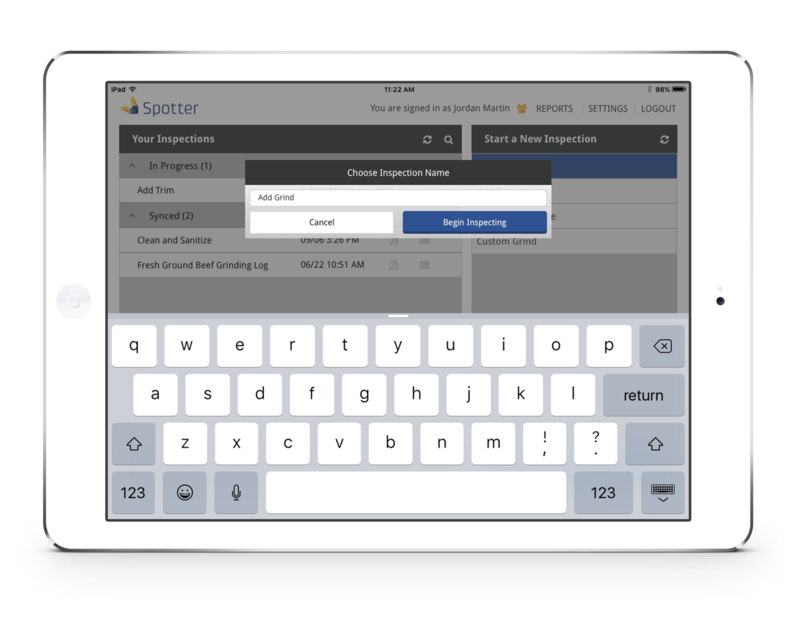 Spotter’s customizable reports provide the ability for dynamic mapping between manufacturers, products, establishments, and their respective IDs. Data entry would be simple, with few steps, and still compile the various essential details in exported reports. Also, knowing there are hundreds of locations, we needed to ensure that users can access the reports specific to their own store from their Spotter-enabled mobile device. With our Spotter app as the infrastructure, we extended its functionality to support Associated Grocers’ specific report generation needs. Data entry and collection for both grinder and administrator are intuitive and help prevent user error. Each action in the existing workflow (e.g. Add Grind, Materials, Custom Grind, Clean and Sanitize Grinder) is correlated to its own Spotter Inspection entry field. As inspections are submitted, Spotter collects and combines the data to build the corresponding reports and stores it on the Associated Grocers Web Portal. Additionally, we linked data collection to the diverse abilities of any tablet camera to scan barcodes. The barcodes register complex information about each product, including product type, manufacturer, date packaged, and retailer destination, which are parsed into readable names via the established associations. Users only have to enter their initials, grinder number, and scan the barcode. This allows administrators to generate Grind Log or Recall Audit reports with any combination of parameters or filters, and update the table of valid manufacturers, products, and establishments as well as the associations between them. With our existing app, we were able to deliver a user-friendly and dynamic inspection system that assures improved meat and grinder management.